If you’re looking for Christmas presents, fancy paper and pretty ribbons, you’ve come to the wrong place. I did do some wrapping this weekend, but it was in the garden (yes, I’m still working in the garden). 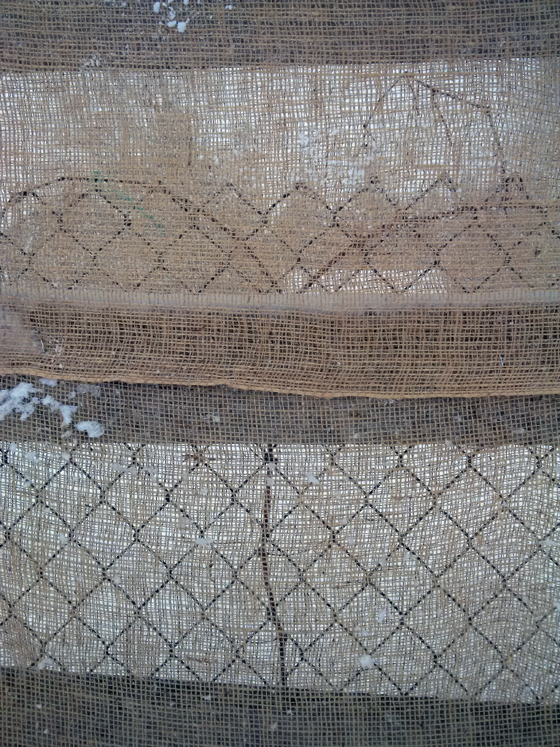 I have wrapped our grape vines in burlap. I have no idea if this is the right thing to do or not, but, as I’ve said before, gardening is an experiment. The grapes are brand new and they’re a wee bit exposed on the outer edge of the garden where it meets the field. 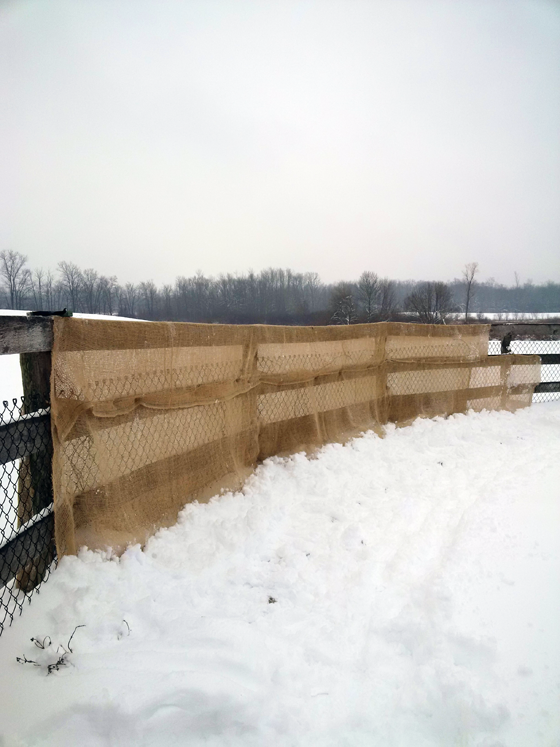 I felt like a bit of additional protection wouldn’t hurt, and I had some burlap lying around, so a couple of weekends ago, I stapled a length of fabric to the fence. Of course, I ran out and by the time I picked up more burlap, we’d had snow. A lot of snow–at least for us and for this time of year. 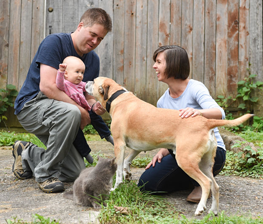 Since I could no longer open the garden gate–unless I wanted to shovel and I had been shoveling for a couple of hours by the time I had the brainwave to finish the garden–I tossed the burlap, the stapler and the scissors over the fence, and then climbed the fence myself. In case you’re wondering, climbing a fence in bulky snow pants and boots is not the easiest. But the snow makes a soft landing. 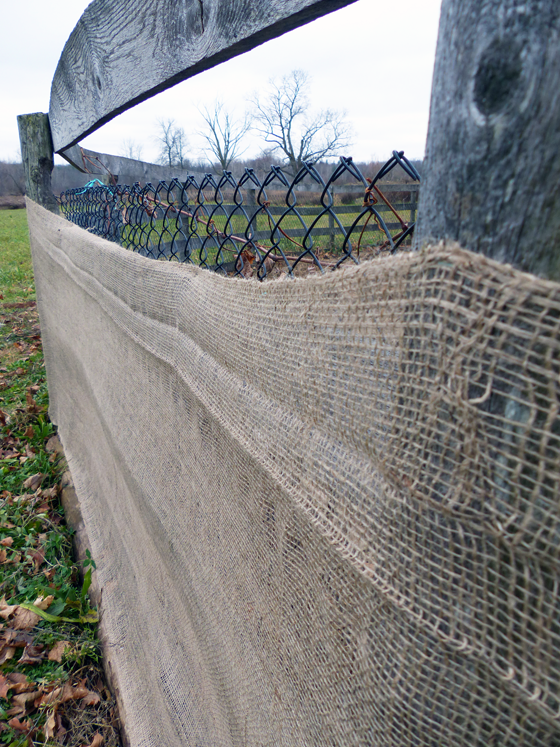 I was grateful we have a wood fence, because it was easy to just staple the burlap right to the wood. 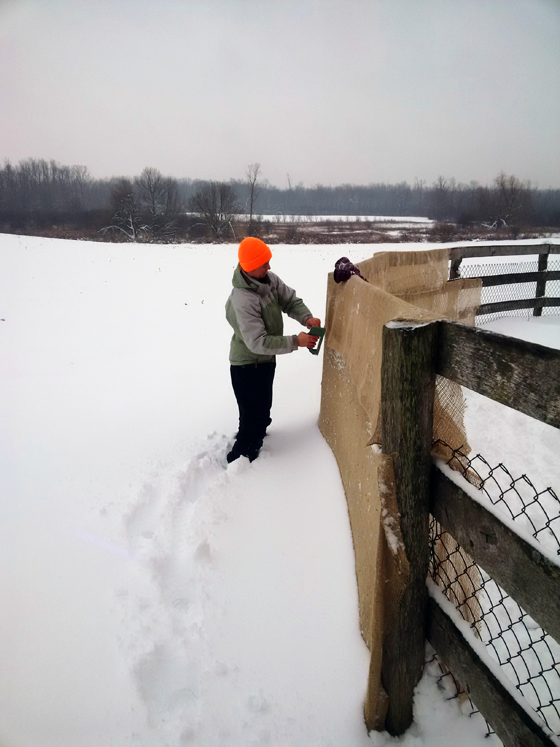 Where the bottom of the fence was buried in snow, I packed the snow against the fabric to hold it in place. Then I ever so gracefully climbed out of the garden again. In Prince Edward County they bury their grape vines every winter. It is a labourious process of untangling fruiting canes, tying them to a low trellis wire on bended knee and ploughing soil over them. It has become standard practice now in the county. Wow. I’ve never heard of that practice before. That sounds like a lot of work. The fact that they put so much effort into insulating their vines makes me feel like I might be doing the right thing by wrapping mine. I hope this works and keeps them happy!